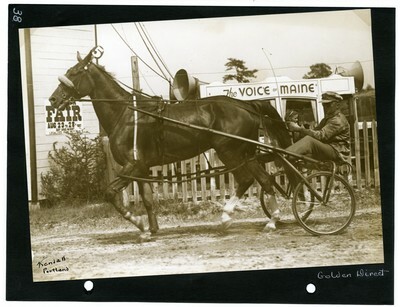 Sepia tone photograph of chestnut gelding, Golden Direct wearing head number five for the 2.14 Pace, Goodhart up at the Wednesday, August 4, 1937 Cornish Fair races, Cornish, Maine. Note the "Voice of Maine" public address system truck in the background of the photo. The race program for August 4 includes an advertisement promoting sales and rentals of public address systems by the Royal Amusement Co., Inc. out of Auburn, Maine. The photograph is signed in the lower left corner by Guy Kendall.